Please Note: As of January 2018, both trips are currently filled. But we do, on occasion, have a space or two open up later in the winter, spring, or even beginning of the summer. So please let us know if you want to be considered for a place if we get an opening. In the meantime, check this website for the announcement and sign-up information for our 2019 adventures. We should have that information ready to go by March. And yes, some boys will start signing up then! 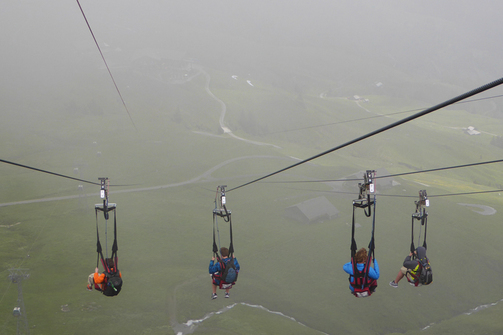 "Flying" in the Swiss Alps in 2015. We'll be going here again! This Europe adventure will be our sixth across the Atlantic and they get better each time. Plans are well underway and boys signing up early get to help make a lot of the travel decisions. In 2018 we're thinking of starting in London and ending in Munich with some amazing stops in between! Some proposed stops on our trek in addition to our gateway cities include: Paris, Amsterdam, Berlin, Prague, Bern, and Innsbruck. Our Europe trips have always filled early. So, pick up a guidebook to Western Europe and think of all the places you could go! Click to read all about our 2018 European adventure. This trip will base around Abingdon, Virginia which will be our starting place for lots of close-in adventures including hiking on the Appalachian Trail, riding mountain bikes on the Virginia Creeper( a rails-to-trails conversion), taking a guided nighttime ghost walk, enjoying a zip-line experience, visiting the Star Museum (a touch of Hollywood in Virginia), going to a drive-in movie, taking in a minor league baseball game, and a bunch more. Click to read just how much can be packed into the one-week Virginia Highlands trip.